There have been many changes since Robinsons of Aylesbury was first founded in 1909. In its earliest days Robinsons carried out removals by horse and cart and if long distances were involved, by railway! It was only after the First World War that "horseless carriages" were purchased. Our first vehicle was a surplus 1914 - 1918 army vehicle, which ran on solid tyres, had a top speed of 10 - 12 mph. and a fuel consumption of approximately 6 - 8 mpg. The boast was "Express Removals - 100 miles per day". 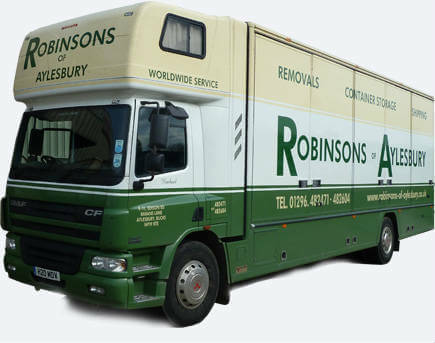 Robinsons reputation for being a reliable removal company has developed along with the town of Aylesbury, and we are proud to say that much of our custom comes through recommendation from customers throughout the Buckinghamshire area from High Wycombe to Oxfordshire. Whether you require removals in the U.K. or to Europe, storage or shipping, we are pleased to be able to provide an efficient yet personal service, combining our years of experience and expert skills with modern techniques and facilities. When you are moving house, Robinsons are well equipped to cope with any sized removals from a single piano to a family home. The company is, in every sense, a family business as it has been handed down from Grandfather to Father to Son and as a result of our years of experience we are pleased to be one of Buckinghamshire's leading removal companies. Our aim is to be able to provide a first class customer service to all clients and from our Aylesbury based head office we are pleased to offer a personal survey by our Estimator throughout the area from High Wycombe to Buckingham as well as extending into Bicester in N. E. Oxfordshire and over into E. Oxfordshire. In addition to carrying out removals all over the UK, if you are looking to move abroad, either to Europe or further overseas, as a member of the British Association of Removers (B.A.R. ), we work closely with other members and have access to a complete Worldwide network of removal companies and shipping agents, which ensures that our customers receive the same high standard of service from our overseas partners that you would get from Robinsons. We have come a long way since the horse-drawn wagons and steam-trains of nearly 100 years ago! Don't take our word for it. See what our customers have to say. Click here >> To arrange your free no obligation survey.